Summary: Flame haired Charity Delafield leads a lonely existence. Growing up in a vast, isolated mansion with her fiercely strict father, she is forbidden from exploring the house, from speaking to strangers, from stepping a foot beyond the tall iron gates- even from reading fairy tales. Told that she suffers from a mysterious 'condition', Charity must never do a thing to over-excite herself- or her imagination. But Charity has a secret. All her life, she has been visited by the same dream- a dream of a dark corridor, and a locked door, hidden somewhere within the house. One snowy day, she stumbles across the door and with the help of chimney sweep, Silas, and a very unusual diary, Charity begins to unravel the strange, magical story of her family's past. Woah! 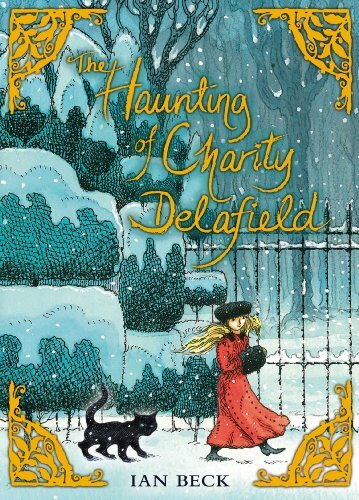 When I first opened 'The Haunting Of Charity Delafield' I thought it was for younger readers. As I read on, I became intrigued to work out the mystery of Charity's missing mother. The novel was fast paced and edgy for such a short read. It made me sad to think that not only did Charity not know her mother but she'd also been lied to. Charity is a loveable yet slightly naïve character who you instantly fall in love with. She can be stubborn and she can be crafty but as a reader I found her fun. I was constantly intrigued to see what would happen next. Charity defies her father and her governess Rose on many occasions and as a reader you are so excited by her intuition and her general naughtiness. You're just as excited to discover the mystery as Charity is. Mr Delafield is a very strict and stern man. He is like that because deep down he truly loves his daughter. He will do whatever it takes to make sure she's safe. To begin with I didn't really like Rose but as you read on you see what a loveable person she really is. I was deeply saddened that 12-year-old Charity had never known or played hide-and-seek. When Charity meets sweeps boy Sila's as a reader you'll be jumping for joy, just like I was. Finally a real life friend. She had never met a boy and before Sila's her only friend was Mr Tompkins the cat. As a dreamer Charity soon discovers some hidden truths about the mansion she lives in and more about the mother she never knew. There are some exciting and captivating magical twists that I really enjoyed. This book is full of magic and mystery and it will bring the child out in you. Not only will you be willing for Charity and Sila's friendship to blossom but for the happy ever after that this young girl deserves. The cover *does* make it look like a read for younger people. But that title is what made me click on your link. It sounds wonderful, I love stories like this. I was literally looking for something good to read and from this review I am sure that it's an interesting book to read. There are many other books of the same author that are my favorite.